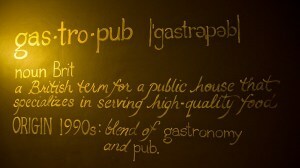 What is a Gastro Pub ? What is A Gastro Pub? One of the fastest growing trends today is the gastro-pub, but how did this concept come into being? Well, to understand the beginnings of this trend we have to go back to the United Kingdom at the end of the 1980s. Up until this time six national brewers dominated the market for beer sold in pubs throughout the UK. These pubs in no particular order were, Allied, Bass, Courage, Grand Metropolitan, Scottish & Newcastle and Whitbread. The rest of the UK pub estate was made up of a smattering of leased, tenanted, and freehold pubs, all serving their interpretation of “Pub Grub”. This prompted government concern about the lack of competition for consumers. So in 1989, a report entitled “The Supply of Beer”, (commonly known as the “Beer Orders”) was produced by the Competition Commission, relating to the supply of beer for retail sale in the United Kingdom”. The Report was damming in terms of the relationship between brewing and pub retailing, and made recommendations aimed to loosen the tie between pub retailing and brewing to facilitate competition between brewers, wholesalers and pub retailers. The Orders were passed into law and restricted the number of tied pubs that could be owned by large breweries in the United Kingdom to 2,000, and required large brewer landlords to allow a guest ale to be sourced by tenants from someone other supplier than their landlord. The large breweries and the industry responded by selling off properties to purely pub-owning companies to get down to the magic number. Individual operators also established smaller groups of pubs through block purchase of the pubs put up for sale by the major brewers. The orders were revoked in 2003, but by this time the damage had been done and the pub scene changed beyond recognition. The new owners decided to distance themselves from the “Old Guard” in terms of offer and physical appearance of the pubs including menu, styling and most noticeable the renaming of many pubs. Names like “The Frog & Firkin”, “Ha Ha Bar” and “Slug & Lettuce” appeared on the high street and indicators such as “Canteen,” “Country Pub & Restaurant, “and “Country Kitchen” were added to pub names to attract food customers. Pubs until this time had been serving dishes such as Sausage & Mash, Fish & Chips, Ploughman’s Lunch, Pickled Eggs, Sandwiches, Sunday Roast, Baked Potatoes and a variety of savory, pies etc. There were more complex menu offerings, but normally enjoyed in a more formal area of the pub, set aside specifically for eating, with table clothes and waitress service. Beer orders changed all that. Significant investment was made by the new owners and the interior décor moved from a formulaic pub chain design to accommodate ripping up the carpet and exposing stripped floors, scrubbed wooden tables, beams, comfortable seating, and an atmosphere that invited people to sit and eat. The whole point of the gastropub was to create an alternative to fine dining restaurants and pubs that concentrate on beer with little in the way of a food offer. Generally, the gastro pub food focus was on locally grown, fresh ingredients as opposed to the old freezer to microwave to table model, the accent was on homemade food and was a for-runner to the increasing importance of fresh sustainable, foods with provenance. So sausage and mash became “A trio of Chicken and Apple Sausages served with locally grown mashed potatoes and redcurrant gravy”, all menu descriptors would comment on the source and provenance of the protein, pies became “Hand raised” and Fish “Line caught”. The menu was more likely to be written on a chalk board and individual menus printed daily as opposed to the heavily branded pub chain laminated styling. Many of the new gastro pubs took advantage of the release of beer tie to the major breweries which led to an influx of “Craft Ales” featuring a changing array of craft ales from local sources, sometimes very quirky in origin, who could forget “Theakston’s Old Peculiar”. And WINE yes WINE virtually unheard of unless it was Liebfraumilch, Mateus Rose or the occasional fruit wine, joined the gastro pub revolution and for the first time you could get a decent glass of wine at your local. In due course the pupil became the teacher and the major brands and breweries that were left after the “Beer Orders” joined the gastro Pub band wagon, thereby sealing its fate and future popularity. The Spotted Pig in New York City is generally accepted as the first gastropub in America. Opened in 2004 by a British chef, the Spotted Pig quickly became one of the city’s busiest and trendiest versions of an American gastro pub, but to be fair the concept has now “Morphed” from those transitional beginnings and the term “Gastro Pub” in places other than the UK, has more a reflection on a venue that combines imaginative, upscale cooking techniques creating casual dining and a unique atmosphere, than that with its UK origins. American gastropubs have increasingly become their own breed, creating a new generation of the classic American pub, a lively restaurant and bar that offers affordable American food, mirroring the rise in America’s interest in craft breweries. American gastropubs have also embraced the “small plates meant for sharing “, but always with the mantra “Farm to Table”. The idea and designation of gastropubs becomes blurrier as the concept is adopted more frequently into the American culture, but whatever the differences are, the gastro pub revolution has still some way to go before its popularity fades and something new comes along. When it does, rest assured I will be here to tell you about it.